If you thought meat-eating plants were only found in the movies, think again. The tiny sundew plant attracts and traps unsuspecting bugs and insects and then digests them for a tasty meal. How it weaves its magic spell and manages to devour the bugs may surprise you. Sticky leaves trap insects when they explore the sundew plant. 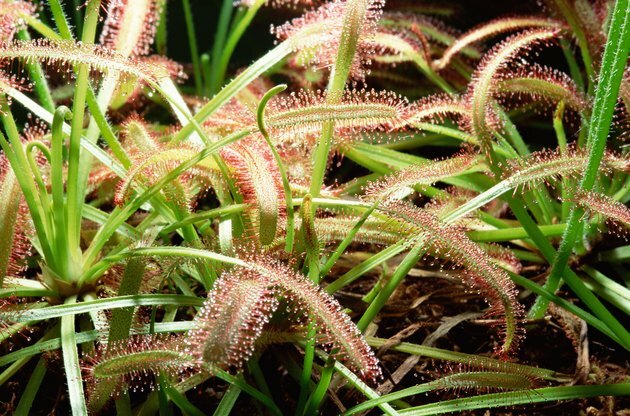 The sundew plant produces a sweet, sticky fluid that coats the tiny hairs covering the leaves. This "dew" glistens in the sunlight and attracts insects who are fooled into thinking they will get a tasty meal of sweet nectar. Sundews also emit a sweet fragrance to attract insects to the plants. As insects land on the sundew plant in search of food, they stick to the dewy liquid on the leaf hairs. Struggling to free themselves from the sundew's grip creates a tighter trap, as more sticky hairs cling to the insect. Small flying or crawling insects find themselves trapped by sticky dew and are unable to free themselves. Once the sundew plant has a solid grip on its prey, the leaves curl over the insect to hold it tight. Digestive enzymes secreted by the leaves begin to digest the tiny bug until all that is left is the exoskeleton. When the leaves open, the outer shell of the insect eventually falls away and the sundew waits for its next meal. Many sundew plants change color depending on the amount of sunlight they receive. When sunlight is plentiful, leaves turn a bright red, but if they grow in shady areas, leaves are green. Some sundews are a greenish-red. The size of the sundew plant depends on the particular variety. Some, such as the short-leaved sundew, are only an inch in diameter, while others may reach heights of 8 inches. Flowers appear on tall, slender stalks -- opening for a few hours in the early morning. What Happens If You Put Your Finger in a Venus Flytrap?